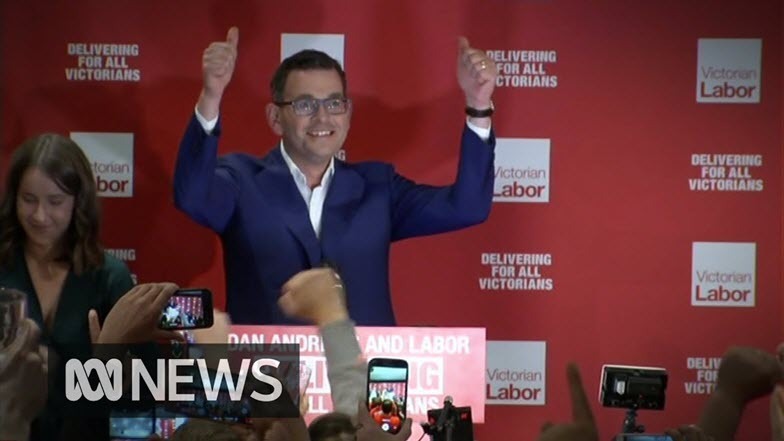 For an election campaign dominated by racist rhetoric and dog-whistling by mainstream politicians, the ABC barely mentioned the word “race” in its Victorian election-night coverage on Saturday. The overwhelmingly white panel and correspondents from various parties (and a train) made occasional references to “law and order” issues, and reporter Ben Knight’s package mentioned, almost in passing, “highly publicised crimes, particularly by young men of African descent”. But otherwise, commentary focused on other issues of the campaign — bread and butter electoral results, leadership speculation about Matthew Guy, the impact of federal Liberal Party chaos, and a hell of a lot about level crossings. Victorian Liberal Party president Michael Kroger mentioned his party’s focus on crime during the campaign, but wasn’t pressed on the racist line pushed by his party both locally and federally and picked up by the Herald Sun, 3AW and, nationally, on Seven’s Sunday Night and even the ABC’s Four Corners. The divisive campaign tactic wasn’t spoken about in any detail until well after the election was called, when Greens leader Richard Di Natale was interviewed, saying Victorians had rejected “a campaign based on fear and division”. Throughout the broadcast, Antony Green struggled to pronounce the name of Labor candidate Manoj Kumar, at one point saying, “I don’t even know if I’m pronouncing his name correctly, he’d be just pleased I’m calling this as a victory.” For what it’s worth, Manoj Kumar is a name with four syllables and Kumar is one of the most popular names in India, the country of birth for 1.9% of Australia’s population in 2016. Four Corners’ report covered the “skewed” reporting of the so-called “African gang” crisis, speaking to people from South Sudanese communities about their experiences of being racially profiled. Similarly The Drum had discussed the issue regularly in the lead-up to the election, with advocates from community groups and lawyer/advocate Nyadol Nyuon. Local radio host Jon Faine also discussed the issue at length in the lead-up to the election on his programs. So the ABC is capable of nuance on the issue of race, even if none found its way into the election-night coverage, which dominated ratings compared to the free-to-air commercial networks and Sky News. How to cover racism is an ongoing question for journalists — one that news outlets both locally and overseas have not always made great decisions with. Neo-Nazi Blair Cottrell’s various appearances on Australian TV are just one example. American anti-racism educator Robin DiAngelo told the ABC last year, though, that to move past racial prejudices, we need to engage with them. “People don’t want to feel bad and they don’t want to engage with questions as to whether they need to give up some of their privilege,” she said. Crikey asked the ABC whether it had intentionally ignored the issue of race during its coverage, whether it had a policy on how to cover race and racism, and why its cast of presenters and journalists for the program hadn’t been more diverse, but we didn’t receive a response by deadline. It’s a curious choice for an outlet that recently sacked its first culturally diverse managing director and has had two sit-down interviews with white nationalist Steve Bannon in the space of two months. The coverage was one one of the worst I’ve seen from the ABC. Too many seats called prematurely and candidate interviews conducted on that basis. The “defeat” of Liberal panellist John Pesutto that wasn’t (looks like he’ll scrape back)- what an embarrassment. The call of around 60 seats for Labor now looks like quite an over-estimate, they’ll be doing well to crack mid-50s. And to top it all off, they couldn’t even produce the traditional much-loved call of the board, just before close of telecast. I appreciate that the pre-polls and a multi-party system bring their problems- well, don’t make calls where the evidence isn’t there. We’re adults, we can cope with “undecided, too soon to call”. It is to be hoped that the federal election telecast is a vast improvement on the mess we were served on Saturday. What would “race “have to do with election night TV coverage? The coverage was about election results not race or colour issues. As you pointed out, Four Corners and the Drum had plenty of different Races on their programs. Do you feel that instant gratification in obtaining Immediate positions in Austrailan Government, Corporate Boards and/or perhaps everywhere is guaranteed to every migrant on arrival? It will happen over time as a natural progression as migrants work their way up through the system. But do bear in mind that the Directors Old Boys ( and a few Girls) network is hard to join, even for “old white men ‘ unless of a certain Aristocratic birth. In twenty years or so I’ll bet there will be Plenty of Indian or Chinese decent people on Boards. In fact they will likely own most of the Companies. On the other hand we could apply the Post Apartheid South African Government method of proportional representation. There, Black people outnumber White People by about Nine to one so Companies were required to employ Nine Black people to every one white Person. Is that what you would like to see here? I am not sure of the numbers but 1.5% Indian population of Australia would equate to about 330,000. Which including senior roles across the board of employment in Australia is possibly fairly close. Antony Green is past his use by date and should be retired into that big tally room elsewhere. Lawyer/advocate Nyadol Nyuonis your typical ABC News ‘go-to’ apologist who obfuscates the real problem with the South-Sudanese young males – that of the importation of a third world violent male dominated culture into the poorer suburbs of Melbourne, with dire consequences for the future. She has used the misleading line that only 1% of the crime in Victoria is committed by her clients, without noting that South Sudanese make up 1/10th of one percent of the population. That is a 10 fold over-representation in the crime statistics. And while we are on the topic of racially identifiable crime in Australia, perhaps someone could inform us of the crime rate of ‘white’ south Africans in Australia; a difficult task I would expect because it is negligible. Antony Green could probably give you an electorate by electorate breakup of a number close to zero. Offence seeking isn’t difficult, writing cogently is. This piece mentioned a few elephants in the room. But it didn’t mention the gross comments made following the tragedy at Bourke Street which effectively held an entire set of communities, congregations, imams etc as liable and responsible for the actions of one person. Perhaps this is a symptom of the possible fact that people no longer take anti-Muslim crap seriously now. Perhaps the same could be said of other race elephants in the room. I would have expected this particular kind of divisive comment to rate a mention. The ABC often goes out of its way to not mention race in news coverage early on in its reporting cycle when facts are not clear and this can often feel a little awkward and poorly handled. I don’t think this was a problem in the election coverage though. Although there are some aspects where race is part of current Victorian politics, I would not say it is the main focus. It is just the natural amount we have in a society that is rapidly changing and the way we all work through that change at our own pace, some faster than others. It has always been thus. I am pretty sure Anthony Green is familiar with the name Kumar. It was Manoj’s first name he probably had a bit of trouble with and I am sure he knows how to say it now. Just like lots of people from all ethnicities, Manoj probably has people mispronounce his name all the time and this will get better the more people hear it.